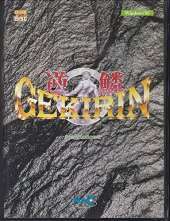 Gekirin is a self-described "RPG without a story". The player takes the role of a nameless male adventurer in an abstract medieval town, equipped with basic weapons and armor. The bulk of the game takes place in a gigantic multi-story overhead randomly generated dungeon. The protagonist explores the dungeon in search of a precious sword, descending deeper and deeper, looting treasure chests, and fighting respawning enemies in action-oriented combat, which grants him experience points. Ranged and melee weapons are available, as well as attack items (bombs etc.) and special items (such as keys that unlock new areas). Equipment and items can be bought in the town's stores. The hero's weapons and armor rapidly deteriorate and must be repaired or exchanged for new ones when their rating reaches zero. It is also possible to attack walls, carving alternate pathways through the dungeon. When the protagonist dies he is teleported back to the town and the player can attempt to tackle the dungeon again.